An animal cell is known as a form of eukaryotic cell that makes up many tissues in animals. Animal cells are distinct from other eukaryotes, most notably plant cells, as they lack cell walls and chloroplasts. They also have smaller vacuoles. Due to the lack of a cell wall, animal cells can adopt a variety of shapes. A phagocytic cell can even engulf other structures. These cells are of eukaryotic origin and their nucleus is double membrane bound. They also have their DNA within the nucleus unlike the case of Prokaryotic cells. 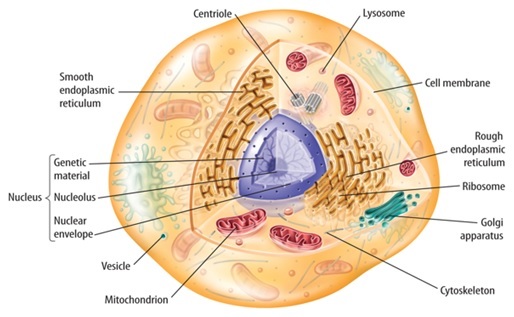 Additionally, they consist of membrane bound cell organelles present in the cytoplasm, and certain cellular structures which are required to carry out basic cellular operations. Cell organelles are involved in wide range of cell activities like production of enzymes or hormones in order to generate energy. Plant cells as well as animal cells both have eukaryotic origin and contain cell organelles. As compared to plant cells, animal cells are smaller in size and tend to have irregular and indefinite shapes while plant cells are either rectangular or cuboidal shaped. The most characteristic difference between a plant and animal cell is that animal cells lack the presence of cell wall, vacuole and structures called plastids which have harvesting and storage functions. 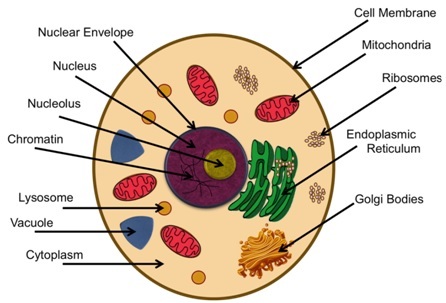 A typical animal cell consists of various cell organelles like endoplasmic reticulum, mitochondria, cilia, centrioles, nucleus, lysosomes, golgi apparatus, microtubules, peroxisomes, ribosomes and flagella. Plasma Membrane: It is a thin, selectively permeable membrane which covers the cytoplasm and is involves and cellular transport. Ribosomes: These are large ribonucleoproteins consisting of RNAs and proteins, ubiquitous in all animal cells, which translate the genetic information stored in the messenger RNA into polypeptides. Endoplasmic Reticulum: It is the largest single membrane bound intracellular compartment. It is an extensive network of closed and flattened membrane-bound structure involved in protein synthesis and post translational protein modification. Golgi complex: It is a single membrane bound organelle and part of endomembrane system. It consists of five to eight flattened membrane bound sacs called the cisternae. The Golgi apparatus is often considered the distribution and shipping department for the cell’s chemical products. Lysosomes: These are membrane enclosed compartments filled with hydrolytic enzymes that are used for the controlled intracellular digestion of macromolecules. They contain 40 different types of hydrolytic enzymes including proteases, glycosidases, lipases, phospholipases, phosphatases and sulfatases. Mitochondria: It is an energy converting organelle which is present virtually in all eukaryotic cells. They are the sites of aerobic respiration. They produce cellular energy in the form of ATP, hence they are called “power house” of the cell. Peroxisomes: It is a single membrane bound small organelle present in an animal cell. A major oxidative reaction carried out in peroxisomes is the β-oxidation. β-oxidation in mammalian cells occur both in mitochondria and peroxisomes. Microtubules: These are hollow, cylindrical structure, present in animal cells and play crucial role in the determination of cell shape and cellular motility. Cilia and Flagella: Eukaryotic flagella and motile cilia have a specialized arrangement of microtubules which are remarkably similar in their organization. A flagellum possesses a central bundle of microtubule called the axoneme, in which nine outer doublet microtubules surround a central pair of singlet microtubules (9+2 arrangement). Centriole: It is a barrel shaped polarized structure made up of microtubules. Centrioles are present in most of the animal cells, called MTOC (microtubule-organizing center). They participate in the process of cell division. Nuclear envelope: It consists of two concentric membranes called the inner and outer nuclear membrane. The outer membrane is continuous with ER. In contrast the inner membrane carries unique proteins that are specific to the nucleus. The nuclear envelope contains nuclear pores for transport of macromolecules between the cytoplasm and nucleus. Nucleolus: It is a non- membrane bound dynamic body which disappears in the late prophase and reappears in the telophase stage of cell division. It consists of rRNA genes in the form of partly condensed chromatin and ribosomal precursor particles. Chromatin and chromosomes: A chromatin is an organized structure of DNA and protein that is found in the nucleus of eukaryotic cells. It contains a single dsDNA in coiled and condensed form. The difference between chromatin and chromosomes is that chromatin is less condensed and extended DNA while chromosomes are highly condensed DNA. The extent of chromatin condensation varies during the life cycle of cells. The light staining, less condensed portions are termed as euchromatin while the darkly stained portions are termed heterochromatin. Animal body comprised of trillions of cells. In humans, there are numerous types of animal cells performing different functions. For example, neurons participate in the cell to cell signaling of electrical impulses, red blood cells play role in oxygen transport to various organs and tissues of the body. Different organs have cells specific to their functions like hepatic cells of liver are involved in detoxification while kidney cells are involved in urine filtration.